Some people want to be able to extend the list of mime-types supported by the WordPress inline-uploader. There are a number of different ways in which this could be achieved ranging from adding a option to allow any file type through to a plugin which allows easy configuration of an extra list of mime-types through the administration interface. Seeing as a hook exists (upload_mimes) to filter the list of supported mime-types it is fairly easy to knock together a simple plugin which adds a set of mime-types. However simple that plugin may be it doesn’t give you a nice admin interface and an easy way to manage the list in future which is where my new plugin WordPress mime config steps in. 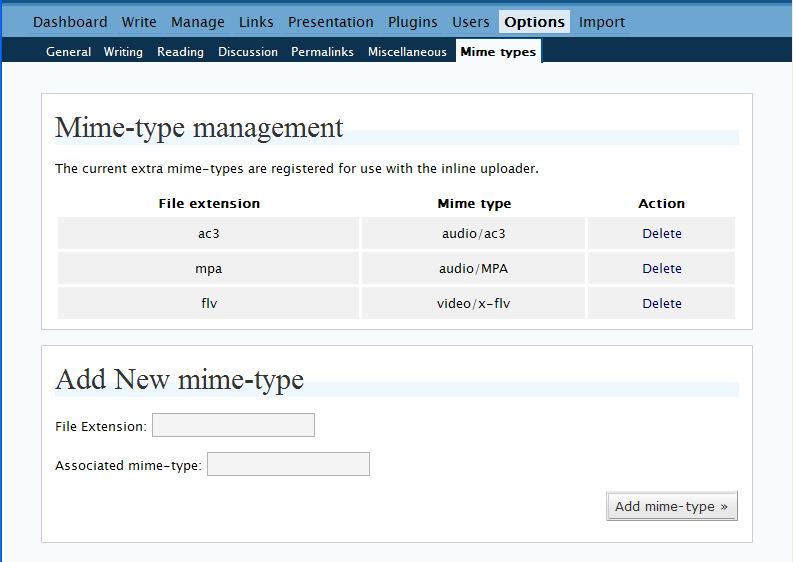 The plugin adds a new options page as Options … Mime-types which allows you to add/delete the extra mime-types. Some people just don’t get ebay! Great work, I had lots of trouble, all my old download links stopped working once I had upgraded from WordPress 2.7 to WordPress MU 2.6.5. All I had to do is install your plugin, add the mime types for pps and txt files and it worked.